OBX Connection Home > OBX Connection Forum > Help fishing! Family reunion in Salvo in May. Help fishing! Family reunion in Salvo in May. Family re-union has been set for early May, and place rented in Salvo already. Looking to help make it sucessful by keeping as many people occupied and happy fishing as possible. Can someone tell me the best beaches to surf fish in that area? While I doubt we can get the funds together for a Deep Sea Charter - there has been some interest in maybe a full-day Head Boat trip - preferable Gulf Stream? Experience levels range from very experienced to novice. Love to find some nice Bluefish, Red Drum, and Cobia. Snapper and Grouper would be much appreciated too. RE: Help fishing! Family reunion in Salvo in May. Am I seeing right - Cobia season closed for the entire year of 2017????? Even to surf fishing? Dang - been dreaming for a week of catching one on a surf rod. Always enjoyed catching them from a boat in the Chesapeake Bay, and was looking for a new experience. Hopefully not an omen on this trip. Tell me its not so. Are you going to be driving on the beach?If not your not far from Oregon inlet You can fish off the cat walk at the southern end, Depending on where you are in Salvo there are parking area both north and south of the area you can walk over to the beach.The best beach or area to fish from is only accessed by 4x4. There is a pier close by and by using a pier or party boat you will not need a licence . But they are available these days on line. Your family might like this site for new comers to Surf fishing . First let's clear up Cobia regs. Cobia is closed in FEDERAL WATERS for the entire year. FEDERAL WATERS are beyond three miles out. Now comes the tricky part. Individual states are "Encouraged" to go along with the Feds but DO NOT HAVE TO. Last year both NC and VA did not agree with the Feds and NC kept recreational open through August 31st with reduced bag limits. Okay, next topic Pier Fishing for Salvo would be on the Rodanthe Pier, only a short drive to the North. Next, Surf Fishing. There is Surf Fishing anywhere on Hatteras Island, but the regulars will tell you to go South, hopefully to the "Point" if the NPS doesn't shut down access for the Birds. Bluefish should be available. Red Drum and Cobia. Cobia first; not easily caught or caught in quantity from the Surf, especially in Salvo, but Hatteras is a different story. Red Drum always a possibility, but talk to Tackle Shops about the best places. Lastly boat fishing, which I'm most familiar with is a good choice. However, don't rule out a Chaarter. Head boats do not fish the Gulfstream per se. The Miss Hatteras runs some good Wreck fishing trips, however Snapper, Grouper and other "Bottom" fish are heavily regulated by Federal Regulations. In the past few years your allowable catch has been reduced heavily or actually shut down. Check the regulations on the Internet before you plan your trip. You may want to consider a Charter though. A Gulfstream Charter can cost anywhere from $1400 to $2000 for a six man charter. Inshore charters considerably lower. Staying in Salvo you have to make a deision on whether to charter out of Hatteras or go North and fish out of Oregon Inlet. Both would offer good fishing and sometimes distinctly different species. I personally own a Charterboat, feel free to send me a PM with more Questions or more info on Charterboat fishing. Good Luck. How many folks will be fishing if you were to go on a charter? I would imagine it is more than 6 if you are possibly thinking head boat. 6 is the limit on virtually all of the private charters. Pier fishing is an inexpensive option for a large group of people. There are several piers to choose from within relatively short driving time. Have a family tournament from one of the piers. Thanks for great info so far. I will have 4-8 people in this party with interest in fishing. 2-3 being "more experienced". 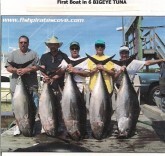 We have enjoyed several deep sea charters from the OBX in the past (Marlin,, tuna, dolphin, King Mackerel, etc). Every trip being a success, but all of these were more than ten years back. Most of the Head/Party Boats we have enjoyed have been out of the Chesapeake area, where we also have also enjoyed Chartered small boat/in-shore Bluefish, Striper, and Cobia fishing. Since it was mentioned: the Miss Hatteras is the head boat we are narrowing down on. Looks like the different experience some of us have said we wanted. Will definitely check on regulations on snapper/grouper as they are a BIG reason for that trip being interesting. Big thanks for that tip. Any idea when the grouper and snapper regulations will be known?????? 3-4 of us are planning on surf fishing or pier fishing almost every day of the trip. Many of us are actually keen to be eating some Bluefish. We differ on croaker. I'm on the boat now I will send PM later with complete write up on Bottom fishing (Grouper etc.) Also the differences between fishing out of Oregon Inlet and Hatteras Inlet. Being in Salvo puts you between both Ports. You can go either way. Also Charter and Headboat fishing are considerably different. Lastly the available species can be different from each area. Probably your budget might be the ruling factor. Talk later. There is a few charters that allow more then 6 people. Country Girl out of Pirates Cove. I believe the Doghouse out of Wanchese can also take more then 6. Pickle can provide of more if there is any. As most of you know 99% of Outer Banks charter boats are licensed by the Coast Guard for 6 passengers. For those with large parties there are two boats licensed for more than 6. As stated before the Country Girl and Doghouse are the two using Oregon Inlet. There is a world of difference between each. The Country Girl is a BC built Custom Carolina and was built with a walk around cockpit that goes up along the cabin. The Doghouse is Custom Carolina that was converted from 6 passengers to be licensed for over 20. However their cockpit can not fish the amount of people the Country Girl can. Most Captains will recommend multiple boats for larger parties on an Offshore trip. It will give the passengers more rod time when trolling. Loved looking at above poster Pickle's website (www.stolatfishing.com.....) Great pics on his Facebook page of what his clients caught wreck fishing during this period. Very helpful and knowledgable. Good thing I got time to figure this out. I have always had great trips on the Rock Solid out of Oregon Inlet. I think he can take out 4 people and it is usually about $400-$500 for a 1/2 day from what I recall. We have had killer dolphin, shark and cobia trips with Capt. Aaron over the years. I have gone out with him five or six times. No and Yes! What? Unfortunately Black Sea Bass is regulated by two different regulatory bodies. North of Cape Hatteras the season opens May 15th (15 fish a person, 12.5" minimum size, South of Cape Hatteras (7 fish per person, 13" minimum size) and it is open currently all year. Why, the Northern population of Sea Bass is controlled by the Northeast Region of the National Marine Fisheries Service and it's advisory councils, wheras the Southern stock is controlled by the Southeast Region of the NMFS. Most Black Sea Bass are caught in Federal Waters so States go along with the Feds. We had an uncomfortable situation several years ago when it was legal in Federal Waters but closed in State, but the State rule read possession "not fishing for". So if you legally caught them in Federal Waters and brought them (Possessed them) at your Dock in NC you were in violation of State Law. That was a Wild Situation, but it's been consistent recently. Why differeing seasons, bag limits, size limits? Black Sea Bass, although one species, has two distinct populations and slightly different coloration. The Northern stock is also heavily fished commercially and recreationally by private, charter and headboats, the Southern stock, because of the availability of Grouper and Snapper, which are very heavily regulated, becomes a second class citizen. In addition the population of the Southern stocks favors smaller fish. Why, who knows! Black Sea Bass are one of the best eating fish available in the Atlantic, however they don't get large. A 4 or 5 pound fish is a great catch. Last point. Think about this, What if you fish out of Hatteras and run North beyond the dividing line before May 15th will anybody challenge you? Okay I'm starting trouble. Have fun fishing. Good Luck. May can be very productive fishing. Here is 2017 Cobia Regulations Season = May 1 to August 31. 36" Minimum Lenghth. One Per Angler and 4 per boat per trip. Are cobia good to eat? what is the best way to cook them? Absolutely good to eat. Some feel they are a bit "Oily" whatever that is. They don't freeze well either. Most of the time they are broiled, grilled and not used in any "Foo Foo" recipes. Just naked fish. However, it is not a fish you will see in Seafood Market regularly and even less frequently on Restaurant menus. Locally it is highly seasonal with the bulk of catches made in late May and June. It is not heavily fished commercially because it is not a high volume fish and prices can fluctuate wildly. Actually, they have been introduced to open ocean water fish farms. It is also hard to market because "Nationwide" very few people have heard of it. There is a strong following in the South who like em. The only restaurant that serves them in season is Basnight's Lone Cedar.